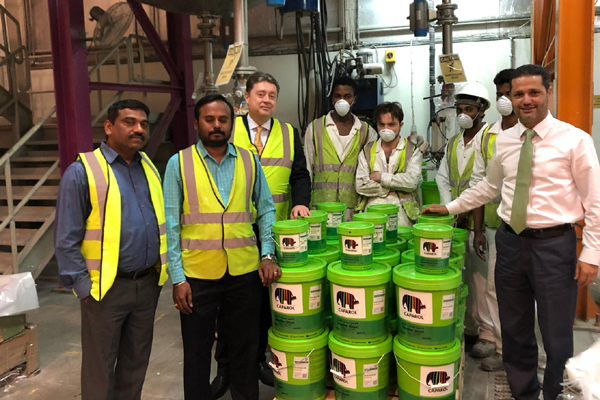 Caparol Paints, a global provider of German paints and coating solutions, has announced the rebranding of its product packaging with new green buckets. With a ‘Go Green’ motto, the new look-and-feel of Caparol products is a significant improvement over the old packaging, said a company statement. This initiative falls in line with the UAE Vision 2021 National Agenda, which aims at sustainable infrastructure development in the country, it said. This rebranding marks Caparol’s commitment to join hands for protecting the environmental interests of residents, businesses and organisations. Caparol takes the responsibility to find a balance through economy, environmental compatibility and quality of life. This includes protection of the environment, efficient use of resources and creation of a comfortable living environment for the people. “With this, we aim at playing a key role in initiatives, which define and accelerate the growth of sustainable development. We care for the environment and believe in ecological advanced development while preserving the environment,” he said. “Sustainability is our responsibility and the prime reason for us to strategically rebrand all our packaging into ‘green’. This also outlines a framework for building a responsibility and conscious infrastructure that applies a living system view to the business and inspires all our stakeholders and customers to follow a path of sustainable development,” he added. “Our plan with the rebranding is to promote a healthy living through our wide range of eco-friendly products with low emissions and free from all harmful elements. The colour ‘green’ stands for purity, balance, nature, vitality, growth, health and rebirth. This attitude of sustainability and healthy living has always been part of our corporate philosophy and we are happy to encourage such initiatives to put the region on a sustainable path,” Balish elaborated. “Our solicited input from local markets around the region to aid in the development of the eco-friendly design ensuring broad acceptance and appeal,” Balish concluded. Caparol is a ‘responsible business’ partner for millions of customers around the world for more than a century, with a social commitment to create a sustainable future.